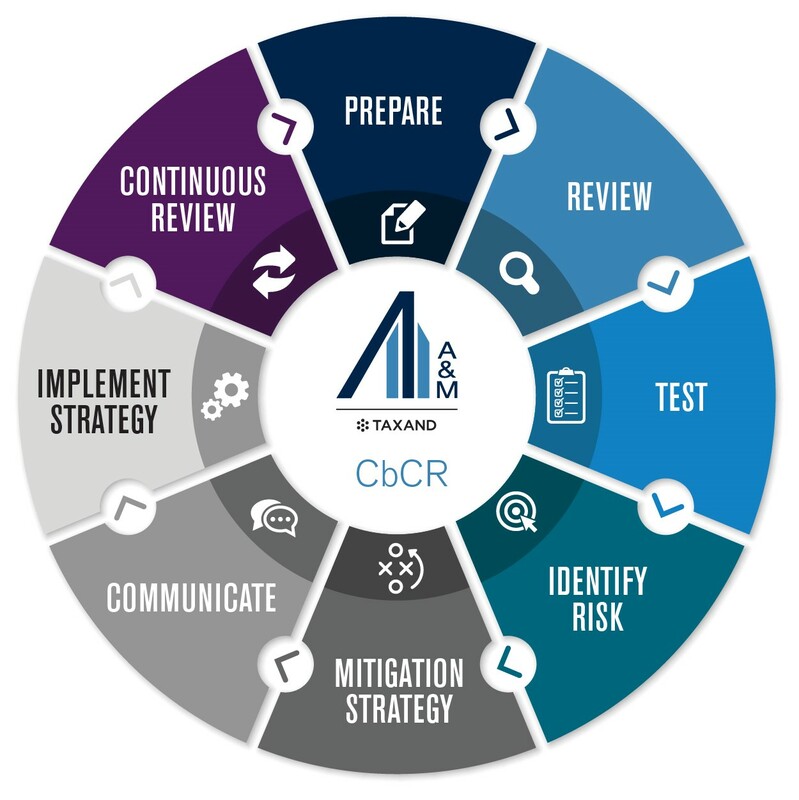 At A&M Taxand, we have developed a comprehensive framework to help you assess the output of your CbCR, identify specific areas of potential risk, develop mitigation strategies and communicate the findings amongst your relevant stakeholders. Below is an overview of our framework which we can tailor specifically for your business. Contact us to discuss how we can best help you take control of your CbCR strategy. CbCR—Recent Developments in the U.K. The main change of CbCR requirements that will impact the reporting and compliance burden on U.K. companies relates to the additional notification requirement. This change is in line with the OECD Model and the EU Directive on Administrative Cooperation (2011/16/ EU, or DAC4) on mandatory exchange of information. It will possibly not be welcomed by companies as it creates an additional deadline outside the annual selfassessment return process, even though the actual notification will probably be identical for later years for most companies. Alvarez & Marsal can conduct a high-level analysis of your company’s financial and functional profile in order to help you identify any areas of concern with regards to global documentation requirements under BEPS Action Plan 13 and transfer pricing generally. Time is fast approaching for many MNEs to submit their CbCR with the revenue authorities. Before doing so, it is essential that you and other members of the senior management team fully understand the implications of how your data may be interpreted by the authorities. This edition of Tax Advisor Weekly discusses some practical aspects related to the introduction of country-by-country (CbC) reporting by the Internal Revenue Service and the audit risks large and mid-sized companies may face following the submission of their CbC reports. Recently, the U.K. tax authority, Her Majesty's Revenue and Customs (HMRC), published updated guidance regarding the country-by-country reporting (CbCR) requirements for multinational enterprises (MNEs). On 29 June 2016, the Organisation for Economic Co-operation and Development announced additional guidance on the practical implementation of its Country-by-Country (CbC) Reporting program, published in final form on 5 October 2015 as Action 13 of the Base Erosion and Profit Shifting (BEPS) initiative. The larger BEPS program contains 15 intertwined initiatives that generally seek to limit base erosion and profit shifting by promoting transparency, coherence and substance in tax filings. CbC Reporting is a transparency initiative which recommends taxing authorities require taxpayers to provide aggregate annual business and financial information in each jurisdiction where they do business. The growing issue of international corporate tax avoidance, also known as Base Erosion and Profit Shifting (BEPS), has received significant media and public attention. In an effort to offer clear and tangible solutions for governments and corporates around the world, the Organization of Economic Co-Operation and Development (OECD) released its final BEPS Action Plan in October 2015.